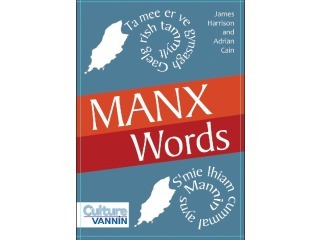 Culture Vannin is pleased to announce the publication of a new dictionary for learners of Manx. Entitled Manx Words this pocket dictionary is a fantastic addition to the growing material available for both learners and speakers of the language. The dictionary has been produced by James Harrison and Adrian Cain of Culture Vannin but has been heavily influenced by the work and assistance of Steve Morris of Swansea University who produced a similar dictionary for leaners of Welsh. Manx Words covers vocabulary encountered by students in their first couple of years studying the language. Each item comes with an example of the terminology being used in everyday situations whilst there are useful word lists covering numbers, days of the week, months of the year and common place names in the Island and elsewhere. There is also an explanation, with examples, of irregular verbs and the most common prepositions. Adrian Cain, the Manx Language Development Officer for Culture Vannin commented ‘This resource will be of real use to anyone who intends to learn the language. It isn’t meant to be a comprehensive introduction to Manx, rather it covers the key vocabulary that students are likely to encounter when they start to pick up the language’. Manx Words is available in the Island’s best bookshops now and retails at £10.